Anybody that knows me well (or has read this blog long enough) knows that have culinary obsessions from time to time. For a while it was baked doughnuts (see here, here, here, and here for proof) then it was s’mores (as evidenced here, here, here, and here) now, it’s cakes. Cakes and brioche. Brioche cake? But back to the topic at hand. 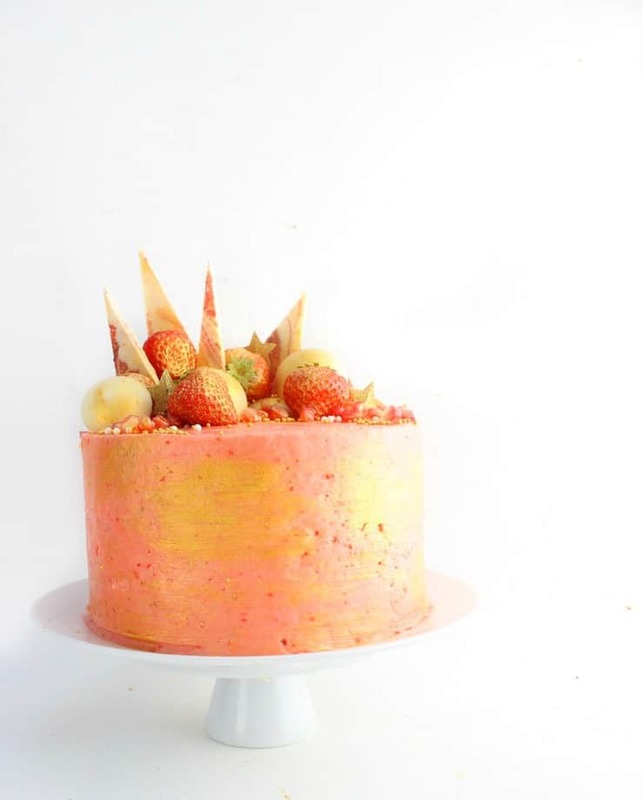 As of late, I’ve been mildly obsessed with all buttercream cakes (you just can’t go wrong with copious amounts of buttercream…) and more than a little over the top obsessed with Katherine Sabbath cakes. Seriously baking peeps, seriously. If this woman’s Instagram is not already a part of your life, make it happen. Make it happen NOW. 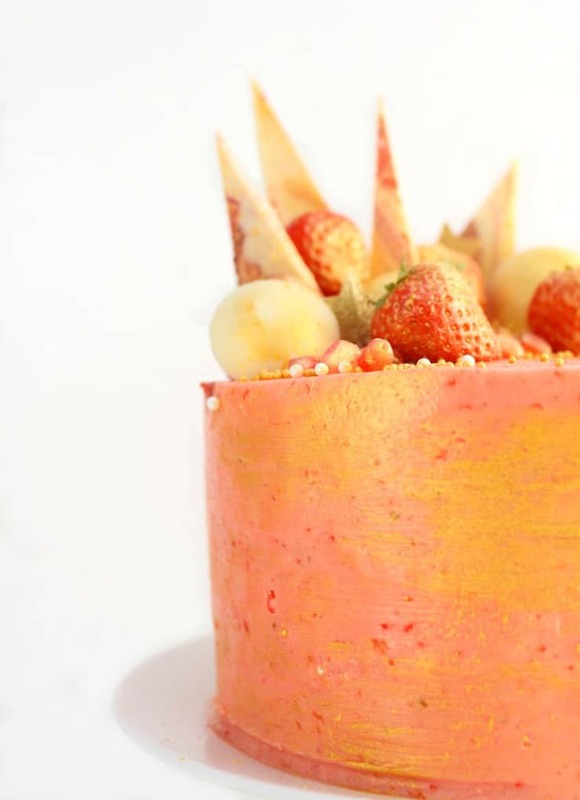 Serious cake goals –> Katherine Sabbath. 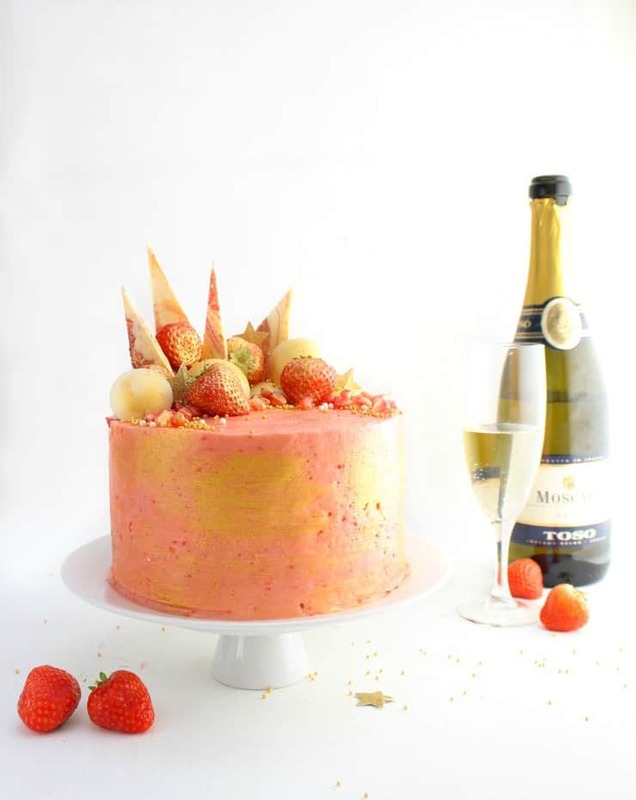 So, with New Year’s Eve right around the corner, I knew I wanted to make something champagne infused… with strawberries (because life lesson #382: you can’t go wrong with strawberries)… and take it to the next level… the Katherine Sabbath level! Bright pops of color! Decadent pieces of chocolate! Juicy bits of fruit! Gold dust EVERYWHERE! Something that would punch you as much in the eyes as in the taste buds!! Ok, bad analogy… I promise no eye punching on this blog. Um, to delight your eyes as much as your taste buds? Yeah, much better! TO DELIGHT YOUR EYES AS MUCH AS YOUR TASTE BUDS! In the bowl of a stand mixer, whisk eggs until frothy. Add 1/2 cup granulated sugar and continue whisking until light and fluffy. Add the rest of the granulated sugar, butter, milk, and champagne, and whisk on low until just incorporated. Add the baking powder, vanilla extract, and flour, and again, whisk until just incorporated. Divide the batter between two lined 6″ cake pans and bake at 350F/175C for 35-40 minutes. Once the pans are cool enough to handle, remove the cakes from the pans, wrap in plastic wrap, and refrigerate until cold. 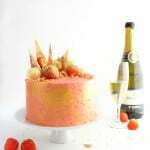 When you’re ready to begin assembling your cake, remove the cakes from the refrigerator and divide each into two. 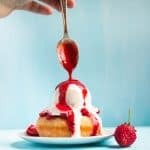 To make the frosting, whisk together the egg whites and granulated sugar in the bowl of a stand mixer over a pot of boiling water (a double boiler). Whisk until the sugar has dissolved and the mixture is hot. Transfer the bowl to your stand mixer and whisk on high until the bowl has cooled to room temperature and the meringue holds stiff peaks (about 10 minutes). Cut the cold butter into cubes, switch to the paddle attachment on your stand mixer, and begin adding the butter piece by piece on medium/low speed. Once all the butter is in, turn the mixer up to high and beat until a smooth frosting forms (5-10 minutes). Don’t worry if the frosting looks over beaten; this kind of frosting will look over beaten before it eventually smooths out to a workable frosting. 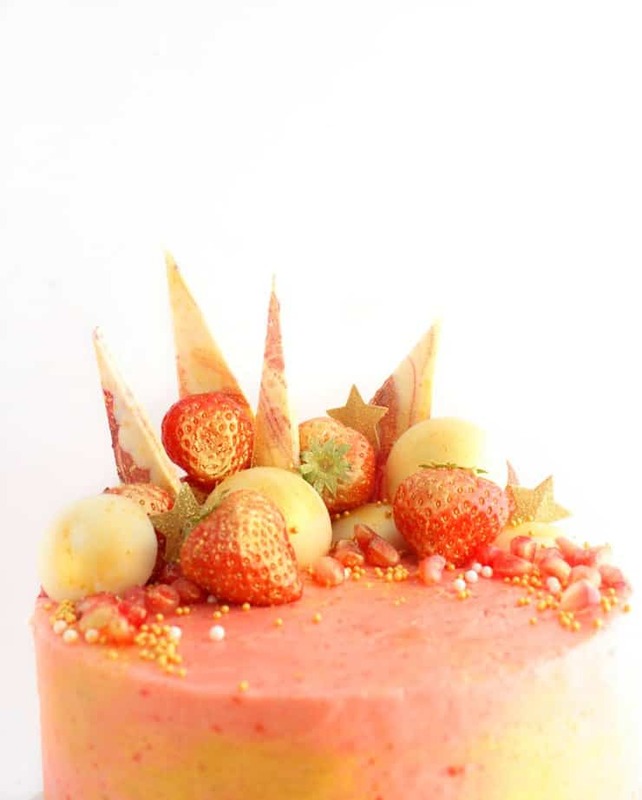 Add the strawberry puree and a little red food coloring to darken the frosting, and mix until just incorporated. 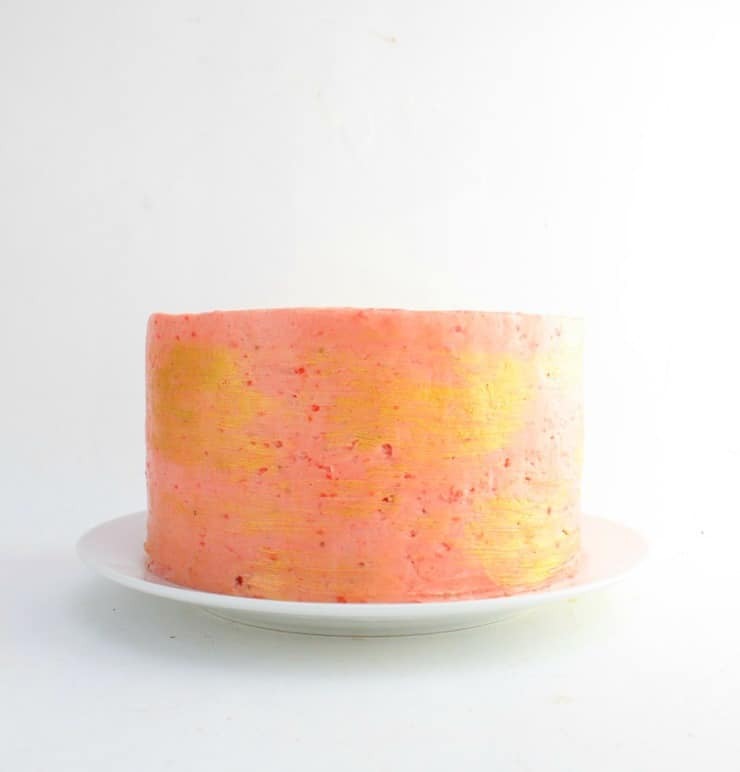 Assemble your cake by frosting in between each layer with your strawberry buttercream, and eventually around the outside. 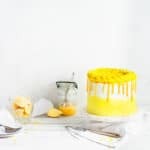 For a little extra pizzaz, brush the outside of the cake with a mixture of gold powdered food coloring and clear extract. 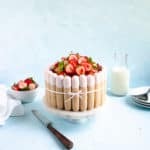 You can garnish this cake with just about anything you want (or anything that seems fitting), or you can use my list above for some inspiration. 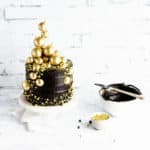 One of my favorite new techniques is giving everything a dusting of gold by dipping a large, dry brush into my powdered gold food coloring and gently blowing it across the cake. I agree, this is stunning! I love the colors and beautiful details. Hi! 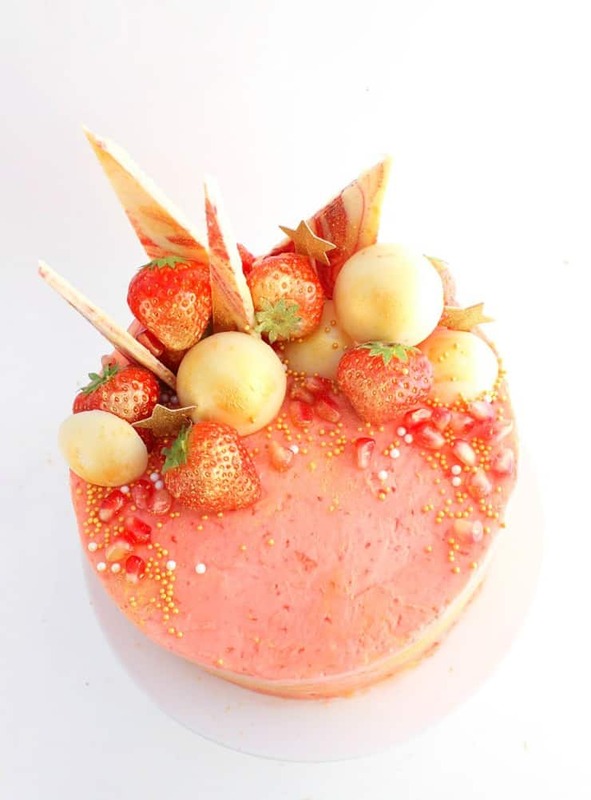 Beautiful cake, I’m going to try making this for my friend’s birthday. Can I clarify if the “1/2 champagne” in the ingredients list is 1/2 cup champagne? That’s where late night editing will get you! Yes, I did mean half a cup, and have change the recipe to say such (as well as check that the rest of the units of measurement were there). 🙂 Hope your friend enjoys the cake! This seriously looks too good to eat! I wish I had some baking talent!